Here are some behind-the-scene personal experiences from the 1930’s that might be of interest. In 1933, our Nazi government appealed to us for a nationwide “non-Aryan” boycott. I experienced the proposed boycott the hard way. One day I went to the local haberdashery I had been frequenting for years, a Jewish firm with the name of Lapp. As I approached I saw one of the new eye catching anti-Jewish pamphlets in the window: “Germans defend yourself! Buy only at Aryan stores.” An SA-man (a uniformed brown storm trooper) was planted in front with his feet wide apart, partly blocking the entrance, & I had to squeeze past him on my way inside, like many others did. When I came out with my purchase he gave me a dirty look & grunted, “Can’t you read?” On my next visit to Lapp’s store I found the SA guard posted there in a more menacing posture. This time he filled the entire doorway & gave me a very rude & sharp-tongued warning never to dare to set foot in this store again before it was “Aryanized.” I was shocked & had to turn away empty-handed. After that episode, my parents warned me to stay out of any dangerous Nazi crossfire. The books were supposed to burn in a glorious bonfire. Various efforts were made, but the “un-German” literature wouldn’t cooperate. We thought the whole fiasco was hilarious & started to giggle. This got us reprimands from our teacher who urged us to put on serious faces. Obviously he understood more about our dangerous behavior than we did. They finally poured gasoline over the books. The fuel burned brilliantly, throwing ghostly shadows in the twilight, but the books resisted being consumed, & only left behind an acrid smell. 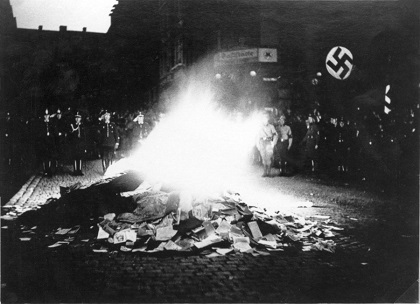 When I got home that evening, I heard on the radio that 20,000 books were burned in Berlin alone. 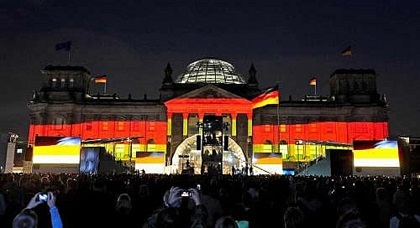 It was a cultural & political fiasco in all of Germany. I hope there are other people out there who can share THEIR experiences of this time period. I realize that my generation is dying out, but I plan to stick around for a while longer!